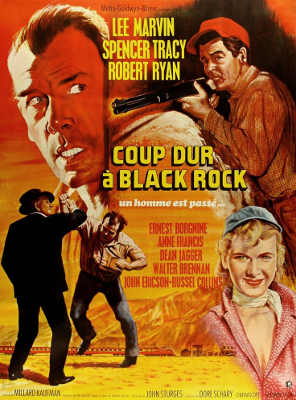 John Sturges' Bad Day at Black Rock (1955) is a compelling mixture of film noir and Western, one that liberally borrows elements from both genres and manages to create a unique atmosphere in the process. It starts out with a terrific setup, too: one-armed John Macreedy (Spencer Tracy, It's A Mad, Mad, Mad, Mad World, Guess Who's Coming to Dinner) arrives in the derelict desert town of Black Rock via express train; it's only the second time the train's stopped there in four years...and within minutes, we realize why. The locals are anything but glad to see an outsider, so he either gets dirty looks or the cold shoulder on his way to a hotel that's practically covered in tumbleweeds but doesn't seem to have any vacancies. He is, quite simply, not welcome around these parts. It's obvious that the well-dressed Macreedy is there for a reason. The dark underbelly of this virtual ghost town is hinted at immediately, but at first we're not sure what it is or who's directly responsible. We're fed pieces of the puzzle as Bad Day at Black Rock unfolds: a missing Japanese man, Macreedy's military service, a burned-down home, and a small group of unhelpful citizens that block him at almost every turn. There are exceptions, of course: spineless sheriff Tim Horn (Dean Jagger, White Christmas) at least seems somewhat willing to help---as do hotel manager Pete Wirth (John Ericson, Bedknobs and Broomsticks) and his sister Liz (Anne Francis, Forbidden Planet)---while Doc Velie (Walter Brennan, To Have and Have Not) eventually becomes his first real ally. But for the most part, everyone's like Hector David (Lee Marvin, The Man Who Shot Liberty Valance), Coley Trimble (Ernest Borgnine, Hannie Caulder), and Reno Smith (Robert Ryan, The Wild Bunch): either smugly tight-lipped or an outright bully. A terrific example of slow-burning suspense that rarely exceeds the volume level of normal conversation, Bad Day at Black Rock feels like an entirely original viewing experience. The ultra-wide 2.55:1 Cinemascope compositions give it a wide-open sensibility, even though most of the confrontations are indoors and there aren't many establishing shots; this actually adds to the suspense, as we never become fully familiar with the town's landscape and aren't able to predict what's lurking around the corner. Based on a 1947 short story by Howard Breslin, the film's gradual evolution maintains our attention during its almost too-brief 81-minute lifespan. Spencer Tracy is an easy standout as Macreedy, the stoic and exceedingly determined man-on-a-mission who feels entirely believable as a one-armed force of nature; even when he's up against tough odds, his resourceful nature (and judo chops) get the job done. Marvin, Borgnine, and company play their parts well, even if most of the smaller characters aren't very layered. Now more than 60 years old, Bad Day at Black Rock can't help but feel a little dated at times...even if, for better or worse, its core social message seems more relevant than ever. 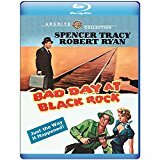 Luckily, the film has earned a third life on Blu-ray from the dependably good Warner Archives, whose parent company last issued Bad Day at Black Rock on a 2005 DVD. We get a much-improved A/V presentation this time around, plus a few recycled extras to boot, which makes for a solid upgrade from a label that continues to impress. I've been very impressed with just about every Warner Bros. Archive Collection Blu-ray that's crossed my path, and Bad Day at Black Rock is no exception. Presented in its original Cinemascope 2.55:1 aspect ratio, this 1080p transfer represents a clear upgrade from the muddy and generally unimpressive 2005 DVD in every department. Image detail and textures are dramatically improved here, as are the film's earthy color palette and grain structure; it doesn't look nearly as dated this time around, which strengthens Black Rock's already-solid atmosphere to great effect. Dirt and debris are basically absent, and no digital manipulation (noise reduction, compression artifacts) was detected either. It's fantastic treatment of a deserving film, and die-hard fans will be extremely pleased. Bad Day at Black Rock's audio is presented in its somewhat original DTS-HD Master Audio 2.0 format (the original 4.0 track, as far as I know, no longer exists) and likewise sounds more crisp and refined than the DVD. Not surprisingly, André Previn's terrific score also benefits greatly from the new lossless presentation, allowing for several moments of modest depth and wide separation. Dialogue is clean and generally easy to understand, but the optional English subtitles are still much appreciated. The static interface (more or less identical to the cover and disc artwork) is clean, simple, and easy to navigate. This one-disc release is packaged in a standard blue keepcase with attractive artwork and no inserts of any kind. Both primary extras from Warner's 2005 DVD are ported over here, including an Audio Commentary with film historian Dana Polan and the film's dramatic Theatrical Trailer. Sadly, John Sturges' excellent audio commentary from Criterion's 1991 laserdisc still hasn't been licensed, but it's floating around online if you're the technical type. John Sturges' quiet but tense Bad Day at Black Rock is a nearly flawless exercise in slow-burning suspense, revealing bits and pieces of its core mystery as the 81-minute film unfolds. 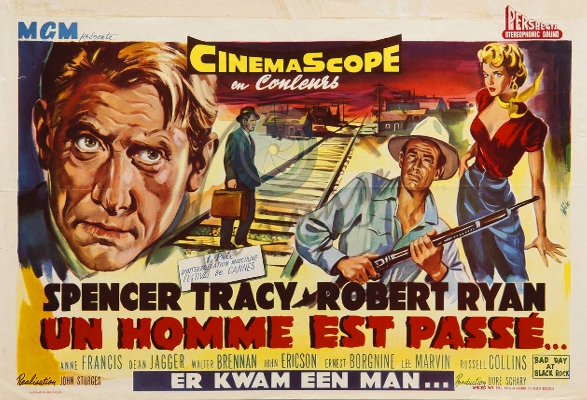 Featuring a standout performance by Spencer Tracy, a dependably good supporting cast, wide-open 2.55:1 Cinemascope visuals by cinematographer William Mellor, and a memorable score from André Previn, it's a great little film to discover (or re-discover) on Blu-ray. Warner Archives serves up a solid upgrade, featuring a greatly improved A/V presentation and a pair of welcome extras. It's definitely worth a spin for die-hard fans and newcomers alike. Recommended.